The other day, my husband Marcus, made a delicious meal using odds and ends from the fridge. Sometimes the best meals come out of using the leftovers! 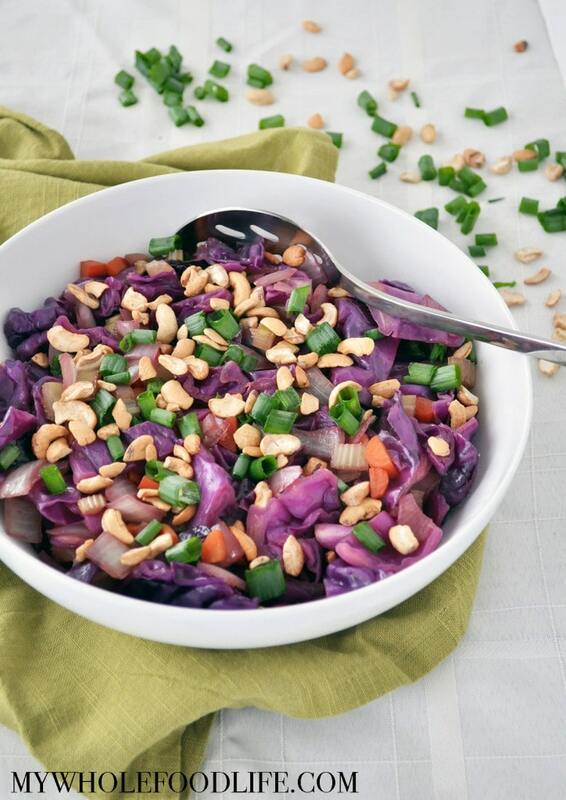 This Easy Cabbage Stir Fry was a perfect example of that. He posted a pic of the meal in my Facebook group, and a lot of people wanted the recipe. So he made it again with measurements, so I could share it with you. If you love cabbage, you will also like my Cabbage Salad and my Asian Slaw. This meal whips up in less than 40 minutes. It’s vegan, gluten free and even paleo friendly. It’s also budget friendly. If you wanted to bump up the protein, you can always serve it over quinoa. The perfect, easy meal to whip up after a long day! In a large covered saute pan , on medium heat, saute the cabbage, carrots, onions, celery, vinegar, soy sauce, sesame oil, and mirin for 30 minutes, OR until the cabbage has softened. Stir often. Remove from heat and serve with a handful of toasted cashews and green onions on top. Melissa Is Laughing Cow Cheese considered a whole food? The ingredients are not great, but it's better than many other options. Wow love cabage dont see too many recepies like this. will def have to try it out soon. I love the colors!!!!!! I often get cabbages in my weekly veg bag - and this is possibly going to become my new favorite way to use it!! Could I use any other vinegar? Maybe? I haven't tried another myself.